Review: LiSA’s entry into Angel Beats! comes with above average expectations. Having heard her performance of “My Soul, Your Beats!” as Yui-nyan’s singing voice, I knew she’d bring more to the table than marina by sheer virtue of singings with emotion to engage listeners. Even with that positive step, Thousand Enemies still lacks polish; you can find plenty of areas in which LiSA could improve upon. I’ll take it though. Anything that can erase Crow Song’s bland singing from my memory is worthy of some attention. 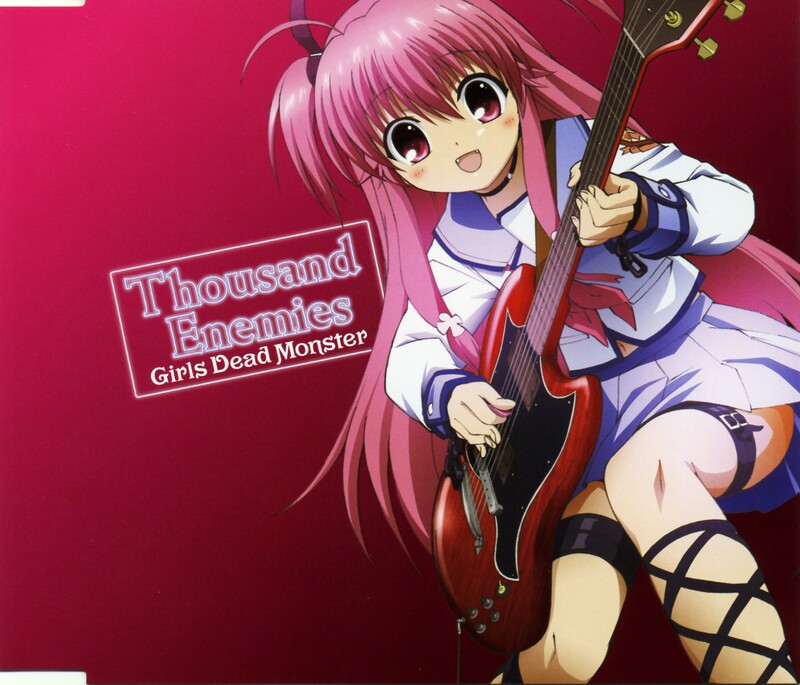 “Thousand Enemies” has the generic rock sound that has become a staple of the anime high school band scenes, at least, if K-ON’s Houkago Tea Time’s music is of any indication. The introduction is promising enough through its effort at grabbing the audience’s attention with its energy, but once LiSA’s voice makes its entrance, it doesn’t take long to see where the performance falls short. Not unexpectedly, one problem is that she sings oh so slightly out of tune. This isn’t something too noticeable in the lower registers, but once she aims high, she comes out of it sounding rather flat. Furthermore, those registers aren’t a range that she sounds too comfortable with, especially during the chorus, which feels rushed. It’s as though she’s doing her best to keep up with the music and while doing so she’s barely hanging on. LiSA is straining to nail it perfectly and unfortunately, we can hear her work at expressing the song’s sentiments through her intonation. And we shouldn’t hear her efforts; good singers make it even the most difficult parts of a song sound easy. That she’s unable to smoothly deliver means she’s got a ways to go even if I can commend her for making an attempt at being expressive. “Rain Song” seemingly confirms the lower registers as an area in which she’s more comfortable. It also helps that the song isn’t a difficult one to perform because the tempo is a lot slower and its relaxing tones propelled through the acoustic guitars is much easier for her to navigate. But beyond the few sections where her voice undulates, it’s a generic, unremarkable piece that lacks any real “oomph” to compel listeners to stand up and take notice. LaLaLaLaLaLaLa Take me with you! for over two minutes straight as they add a chorus to the mix. It’s not so bad if you were doing other things while listening to this song since you can easily tune it out since it works well enough as filler music, but it does become just a bit annoying if you’re listening carefully and was expecting some diversity. Knowing where LiSA is in her singing career, many of the faults I highlighted above are understandable and I do hope that she manages to iron out the wrinkles. That she is not afraid to convey her emotions already gives her a leg up amongst other singers, and with patience and a bit more practice (or some studio editing), her performances will improve. She might not evolve to the point of hitting the upper echelons of J-pop/rock, but at least her singing will be more polished and enjoyable down the road. So far, both of the insert song albums were pretty meh with the first being the worst… Let’s hope the OP/ED won’t disappoint us. Same issues as with the Alchemy release prevail. The songs lack direction; there is no building of emotion, and as such, they’re generic. A good piece of music lends itself to being sung, but as the music is flat, Lisa is already at a disadvantage. She is obviously not yet an experienced singer, so injecting emotion into these pieces is twice as difficult for her. For artists of her skill, variance of emotion consists of getting softer and louder, and not that much more. Eh, they’re okay songs. Not really memorable for me. Anyway, most of it was okay, though not memorable by any stretch of the word. Well, the OP/ED is a known quantity and we’ve heard it at least once. Given Lia’s ability, I think that one will turn out rather well. As for the Inserts…. BLEARGHHHH. I definitely agree with Fuwa^2 but not GO!^2 Maniac because a large part of a song’s appeal comes from the vocals which Aki Toyosaki completely squeals and which I still find annoying. And yeah, Alchemy’s intro was one of the few bright spots from Crow Song. I suppose that’s to be expected when they put indie artists in charge of vocals. Personally, I would have liked to see KitaEri sing it since she’s done well in the past. If I knew more about music composition and whatnot, I’d probably try to dissect this song to see why it’s so generic. Maybe Maeda is going with generic music to befit a high schooler’s aptitude for music. I’ll leave that to lelangir to do. Neither of these songs are bound to stand out, that’s for sure. Yes! Yui-nyan’s hilarious. I wish most characters were that endearing in the comedic way that Yui’s manage to weave for herself. Her singer might not be top notch, but I say Yui-nyan works as a gag rather nicely. The beat sound good but a bit ”off key” at some bits. All right means it’s about average… and that’s where I put it! “These songs deserve better singers, not just random singers that can’t sing properly… that is not good talent… ” What you said here is very important. My wife has been working to make the opera industry for years, and she is continually ignored for people that are less talented. We’ve thought about why this is for some time, and can’t figure out this exact problem. Coming from a recording background the whole GirlDeMo thing just is a disappointment. Yeah, he’s got a good point. Keep in mind with the OP/ED though is sung by people who’ve been tried and tested. Aoi Tada is certainly solid and Lia’s no slouch either (an understatement to say the least!). Not looking forward to listening to the latest GDM, so I’ll be sharpening my knives.